Step aboard with peace of mind, knowing that your safety is guaranteed by the robust hull and intelligent design features that make the Activ 505 Cabin a reassuring choice on the water. Improved transom access, anti-slip bow and fore deck with guardrail protection mean total safety in moving around the boat. 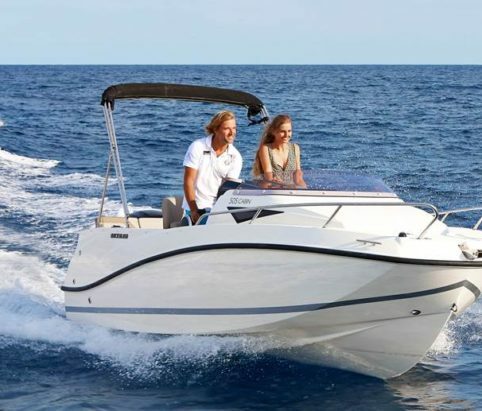 The outboard power of up to 100 horsepower combined with responsive, reliable handling make the Activ 505 Cabin a dream on the water, offering all-round safety, comfort and fun for friends and family. From the stylish lines to the intelligent design features throughout, the Activ 505 Cabin packs a design punch that sends it to top of its class. The Activ 505 profile is stylish and sporty, while the interior cabin experience is enhanced by plenty of natural light and space for portable toilet. With overnight accommodation facilities designed to cater up to two adults, the Activ 505 Cabin maximizes space and comfort with longer berths and space for a toilet that stows away when not in use. The ample lighting comes from two well-placed port and starboard port lights and from the semi transparent sliding cabin door. The well-protected cockpit offers seating for up to 5 people and converts to a picnic area with the optional bimini awning and cockpit sun lounger to top the comfort list providing both sun lounging as well as shade and protection. Need finance? We are pleased to partner with Promarine Finance – click on our calculator below for an instant calculation and a fast decision on borrowing.